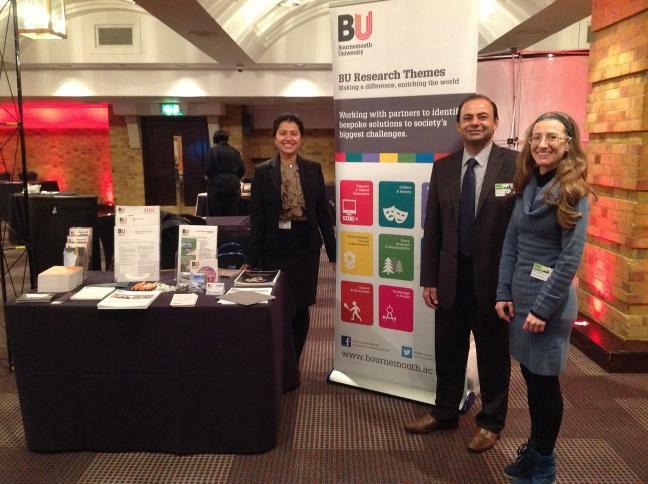 BU Academics Dr Zulfiqar Khan, Professor Mark Hadfield (School of Design, Engineering and Computing), Sukanya Ayatakshi (Business School) and Dr Elena Cantarello (School of Applied Sciences) presented their research at the GovToday Carbon Reduction 2012 event on 27 November 2012 at the Brewery Conference Centre in London. The annual event is designed to bring together academics and public officials to help collaborate on solutions to combat and reduce the UK’s carbon emissions. Attendees included representatives from relevant government departments, agencies and other public sector organisations. BU was on hand to show how their ground-breaking research is helping businesses consider green initiatives and develop green energy solutions. The BU team showcased and promoted BU’s MSc in Green Economy, the first post-grad degree of its kind in the world, as well as their undergraduate and post-graduate courses. They were also keen to talk to attendees about Bournemouth University’s Research Themes and the IMechE Further Learning Programme. Dr Elena Cantarello, teaches Carbon management and Green Technologies for BU’s MSc in Green Economy. She provided delegates with an overview of the principles of the green economy and how these may be implemented in practice to support green economic development. Elena was representing Professor Adrian Newton, who is responsible for coordinating the world’s first MSc on the Green Economy. We are aiming to equip people with the right skills to develop the Green Economy. This is something we strongly believe in and feel passionate about. We want to try and get the message across that we are very much part of the green agenda in terms of renewable energy and renewable technology. Bournemouth University is a strong player in the game and we want to showcase the projects we have, and our expertise and facilities. He presented an overview at GovToday of BU’s engineering and technological solutions for renewable energy and renewable technology needs using case studies of student led community interest projects. Most government policies, especially environmental ones, are designed for larger businesses and then imposed on the smaller ones without taking into consideration their unique circumstances. SMEs are present in all sectors that are liable to environmental taxation. If environmental taxation as a policy instrument wishes to achieve its behaviour changing objective then the first step needs to be effective communication along with practical help and support. Without such support SMEs tend to be distrustful and cynical about any such ‘environment’ related policies especially in these dire economic times. Dr Elena Cantarello, Dr Zulfiqar Khan and Sukanya Ayatakshi also delivered a highly popular and well-attended Learning and Implementation Master Class on “How can we support development of the green economy?” which attracted the biggest audience at the event. With that glowing praise from the public for the wider potential of their work, BU’s academics are off to a flying start and hopefully a greener future.